Five years ago, buying a small business phone system required purchasing thousands of dollars of special equipment (like a PBX), setting up a business calling plan with a major telecom and hiring an IT professional to come out and set everything up. For a startup, this was one of the steps to staring a business that most entrepreneurs would absolutely skip. Go to the seller’s website and choose your phone number and the number of phones that you want. When your order arrives, unpack the phones and plug them into your Internet connection. Begin making and receiving phone calls. The Internet and The Cloud have fundamentally changed the way small business phone systems work and what they cost. But the fun doesn’t just stop with ease of use and price, the fact that these systems work entirely online has created a new universe of features that enable small business owners to save time and be more flexible and productive than ever before. We reached out to small businesses and cloud-based business VoIP providers to learn more about the features that companies value most in VoIP systems, and why. Ten features consistently came up as indispensable tools that help businesses save money and increase productivity. There was a time, not long ago, when having a phone system customized to a business meant a lot of clunky and expensive hardware, as well as an IT expert to help maintain and upgrade it. And when upgrades did happen, it also meant that most of that hardware was obsolete. With The Cloud & VoIP, changes and upgrades are done on the provider’s end, so there’s no need for an IT consultant or a complicated process involving multiple decision makers or a company to approve installation and upgrades. Mobility in general is a big part of what’s appealing about VoIP to many businesses. Audriana Vojkovich-Bombard, marketing communications manager for Nextiva, says that their small business customers are wearing so many hats that being able to handle a variety of communications needs on the go is very valuable. 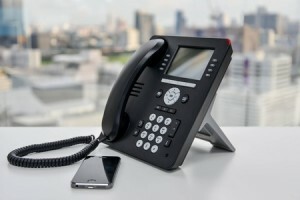 Many VoIP providers, including Nextiva, offer a mobile app that combines voice, video and instant messaging, and can be accessed from mobile devices, a desk phone, or computer. “We love the ability to put an app on a smart phone and take an office line anywhere. If, for example, we are all at a conference together, we can still operate as if we were sitting at our desks,” says Sarah McMullins with Camino Information Services in Houston, Texas. Virtually all VoIP providers include a “conference bridge” with their service. A conference bridge allows companies to host conference calls by providing everyone with a dial-in number and a user id. Some providers also integrate online meetings (where people can share their computer screens with each other) as well as video conferencing capabilities. Additionally, many VoIP providers have an integrated instant messaging system enabling coworkers to exchange messages inside of their business communication platform. For providers that don’t offer a specific collaboration tool directly with their service, they often utilize third-party integrations to provide that capability. Like most cloud services, integrations are the gift that keeps on giving to business VoIP customers. Major cloud software tools like Microsoft, Google at Work, Skype, Dropbox, Box, Tenfold, Zendesk, WebEx and more have built and continue to build integrations with business VoIP services to enable them to work together smoothly. Because they are cloud based, some business VoIP services integrate with customer relationship management (CRM) tools like Salesforce, Act, Zoho, etc. This integration can cause inbound calls to pull up customer records automatically, or let you enter notes during calls. This makes it much easier to log calls with prospects and clients, which leads to better sales processes and higher close rates. Call forwarding may seem pretty basic, but many businesses say the ability to automatically forward or route calls to a third party destination – like a specific phone number or extension – is a huge advantage to them. Time-based call routing creates schedules that allow calls to be routed based on business hours, holidays, special events, says Monica Haley, director of marketing and PR for VoicePulse, a VoIP service provider for residential, SMB and Enterprise customers. “VoIP affords small business owners with high end features that were previously inaccessible to them with traditional phone service,” Haley says. Andrew Schrage with SparkCharge Media LLC says call routing prevents important phone calls from going to voicemail, and allows you stay in better contact with customers and business associates. Haley, with VoicePulse, says the auto attendant feature gives a small business a truly professional appearance by answering calls with a menu that helps to direct them to the appropriate person or team. Nextiva’s Vojkovich-Bombard says the auto attendant acts like a receptionist – and means that a business doesn’t have to have a receptionist on staff. With cloud-based systems, businesses can program callers’ options and route calls automatically to the specified destination. Just because you’re not physically in a city doesn’t mean you can’t have a business presence there, at least when it comes to your phone number. Many VoIP providers will let you choose a number that works best for your business, whether it’s a toll-free, local, or international number. This feature not only sends your voicemails to your email account, it will transcribe them for you, so you can read your messages instead of listening to them. Nextiva’s Vojkovich-Bombard says that saves users the time of calling into a voicemail system, and also helps ensure that important information doesn’t get lost in translation. In addition to savings that come from replacing hardware with cloud-based systems, many businesses see better (or free) rates as a key feature to VoIP. Most plans offer unlimited calling within the U.S. and Canada as a standard feature in their packages, as well as a certain number of toll-free minutes. “For our company, the best part is the flat rate with unlimited calls. I think this is the future of corporate call systems,” says Mark Tuchscherer, co-founder and president of Geeks Chicago.